THE previous short part was introductory and the one before that focused on Andrej Matijević. We are not yet dealing with the EPO connection, but research and background seem vital for this series. Things will connect later. “Several people in Croatia who are familiar with these matters informed us and reinforced additional details regarding Kuterovac and Topić.”We were especially careful in establishing some of the facts here; it took us a while, for example, to gather more information — preferably press reports or something more official — about the sexual-in-nature accusations against VP4 of the EPO as everything published here we typically have hard proof of (even if we choose not to publish it). We never publish anything without a strong factual basis and in this particular case we have court proceedings to support the accusations. Public information from the court in Zagreb, namely a case between Željko Topić and the portal Tjedno.hr, had Topić (during the court proceedings) saying that his marriage had collapsed because of Ljiljana Kuterovac. Several people in Croatia who are familiar with these matters informed us and reinforced additional details regarding Kuterovac and Topić. 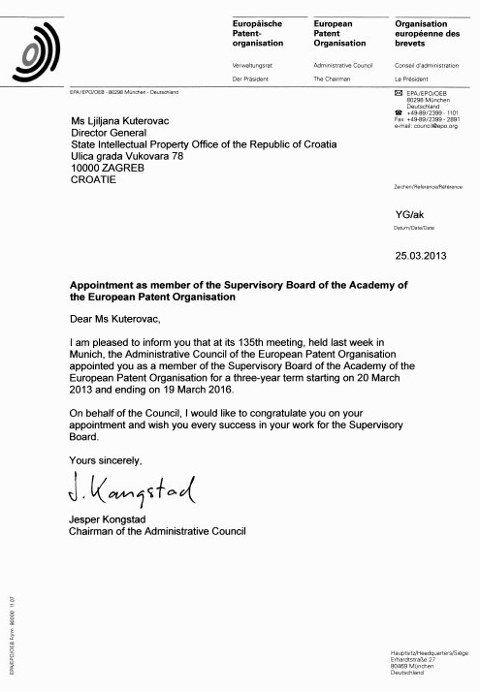 The well-oiled nature of this corruption apparatus is also demonstrated by the fact that during Ms Kuterovac’s term of office as Director of the DZIV the lawyer Andrej Matijević was appointed as President of the Boards of Appeal in the field of Industrial Property Rights. Their close collusion or collaboration is also clearly visible on the attached private photo (Photo #1). It remains to be clarified whether it is merely a coincidence that Mr Matijević and Ms Kuterovac are to be seen on the same photo in the company of a member of the Croatian police who is responsible for the monitoring breaches of intellectual property law and is also assigned to the police department of the Ministry of the Interior directly connected to Interpol headquarters in Lyon. The lawyer Andrej Matijević was reported to the Croatian Parliament’s Committee on the Conflict of Interests on the basis of activities such as those described above and a more than obvious work-related conflict of interest. The influential Croatian newspaper Jutarnji List (“Morning Post”) reported on this in the attached article (Photo #2). Es gibt mehrere Faktoren, die für die Schwere ihrer Vergehen sprechen. Die Klage des Gerichtshofs beruht beispielsweise darauf, daß das Umfeld um die beiden Angeklagten „geschmiert“ ist, wie die aktuelle Situation bei DZIV RH (Staatsamt für intellektuelles Eigentum der Republik Kroatien) und EPO zeigt. Sowohl Matijević, als auch Željko Topić leiten ungestört auf fragliche Art und Weise Prozesse bei DZIV. Dies äußert sich zum Beispiel so, daß dort unter fragwürdigen Umständen Topić’s langjährige Liebhaberin, Ljiljana Kuterovac, als Direktorin von DZIV ernannt wurde. Der korrupte Željko Topić ist dabei noch einen Schritt weitergegangen und hat im Bestreben seinen jetzigen Wohnort in München zu erreichen, seine “Eskortdame” Liljana Kuterovac zum Mitglied des Aufsichtsrates von EPO ernannt.